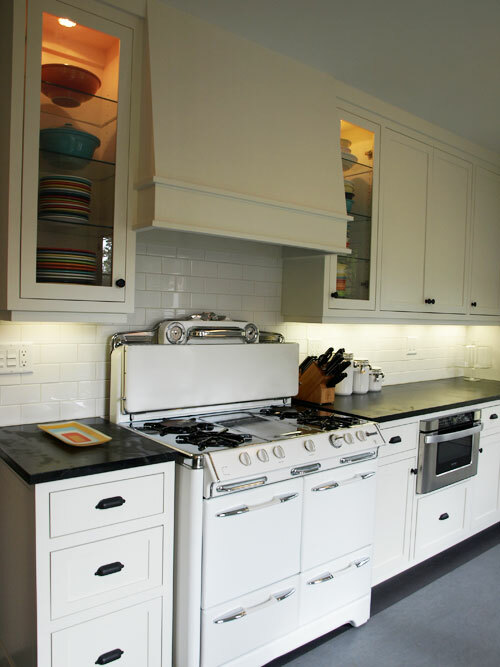 Soapstone has been used for centuries and in the past 10 years or so, it has been enjoying a resurgence in popularity. It is appropriate for both period and traditional interiors as well as contemporary. Soapstone is truly unique in the realm of natural stone. It is a metamorphic rock comprised primarily of mineral talc. It is softer than granite and scratches easily but it is also less brittle and the scratches will blend in as the stone wears. Part of the beauty of soapstone is the gently worn patina it acquires over the years. Small scratches can be sanded away and large gouges can be repaired by a professional stone service. It is inert to acids and alkalis and is so dense, it doesn’t stain like marble. Sealers are unnecessary. The only maintenance required is that you oil the stone with mineral oil. The oil darkens the stone and makes it uniformly dark in color. Soapstone is available in a very limited color range-dark gray/black. When looking at slab in a stone yard, they will usually wet the slab to give you a better indication of it’s color after oiling. In reality, the stone will be even darker with the oil application. Soapstone has a warmer look and feel than granite and it is not subject to damage from thermal shock like granite and the man-made quartz stones. You can place a hot pot directly on the soapstone with no fear of damage. It has been traditionally used for wood stoves, fire backs and hearths, so heat is not an issue. Soapstone slabs are usually 1 1/4” thick. The counter top edge detail that is best is square with a slightly eased edge. You can also have sinks fabricated from soapstone and have drain-board runnels cut into the stone. Soapstone seams beautifully, so the waste is minimal. Honed black granite and the black/charcoal man-made quartz stones imitate soapstone, but do not evoke the same aesthetic. Scratches are more evident and you get a limited warranty on the man-made materials in any honed finish. If you want the look of soapstone, there is no substitute for the real thing, scratches, dings and all. No counter top material is worry free. Consider your design preference and lifestyle and make the best choice for you.